Finish off your dining area with antique silver baskets. 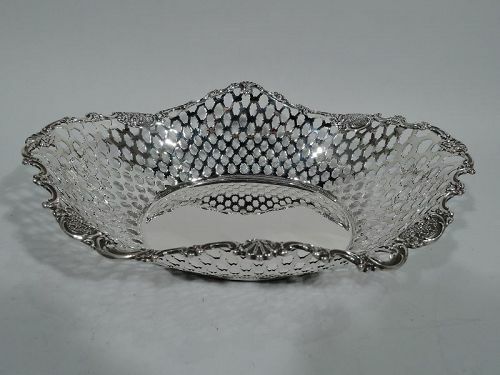 These baskets can be used for fruit or flower arrangements, and we also carry sterling silver bread baskets to store all of your favorite loaves. 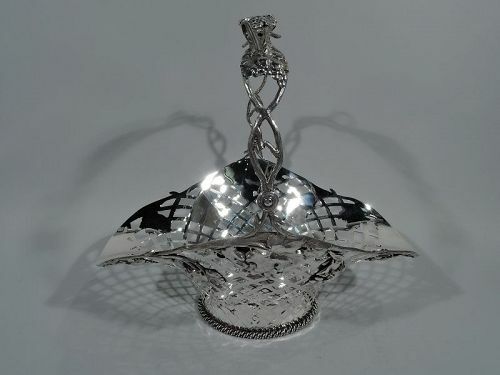 Each antique silver basket comes in a different shape with numerous designs. All baskets are in very good condition. 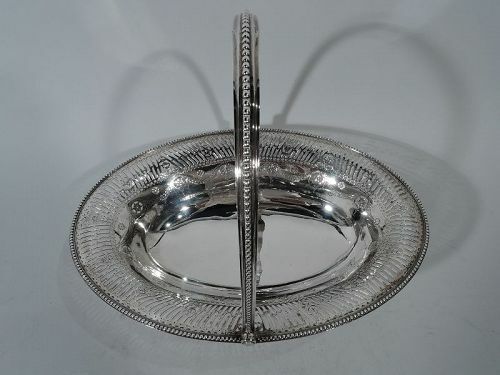 Edwardian sterling silver basket. Made by Tiffany & Co. in New York. Solid oval well. Curved sides with pierced diaper sides and wavy rim with applied scrolls, shells, and flowers. Hallmark includes pattern no. 15517 (first produced in 1902) and director’s letter C (1902-7). Very good condition. 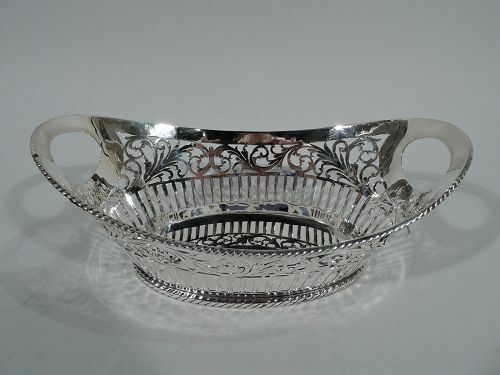 Pretty Edwardian sterling silver basket with roses. Made by Tiffany & Co. in New York. Circular well with flared sides and wide mouth. Sides have alternating solid and pierced trellis. Scrolled and wavy rim in form of rose vine with both tight buds and full blooms. Stationary u-handle with graduated flower heads and split scroll mounts. Hallmark includes pattern no. 16268 (first produced in 1904) and director’s letter C (1902-7). Very good condition. 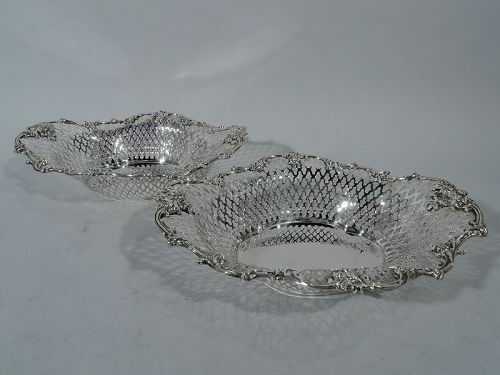 Pair of American Edwardian sterling silver basket bowls. Each: Solid oval well with asymmetrical and tapering sides. Pierced colonnade and scrollwork. Cutout oval end handles. Cabled rims. Hallmarked. Very good condition. 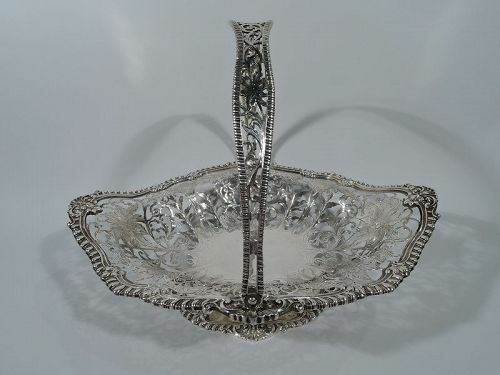 Large and bountiful Art Nouveau sterling silver basket. Made by Mauser in New York. Oval with flared ovoid mouth and c-scroll open swing handle. Open weave sides with vine-form rim fruiting grape bunches applied to sides. Handle same. Hallmarked. Number 692. Very good condition. 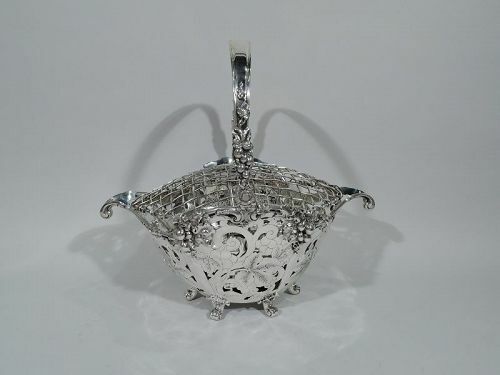 Large sterling silver basket. 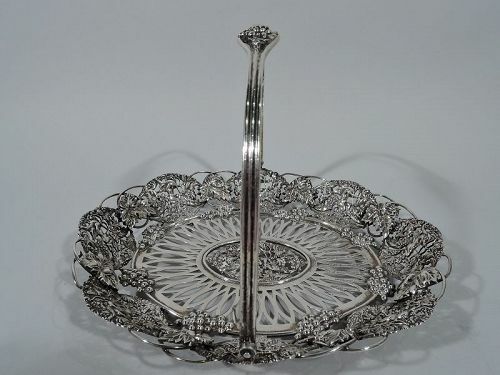 Made by Black, Starr & Frost in New York, ca 1900. Shallow and ovalish with c-scroll swing handle and raised foot. Solid well (vacant) radiating pierced and engraved flowers and scrolled foliage. Handle same with oval cartouche (vacant). Rims wavy and gadrooned and interspersed with shells. Hallmark includes no. 91/4522 and phrase Exclusive Design. Very good condition. 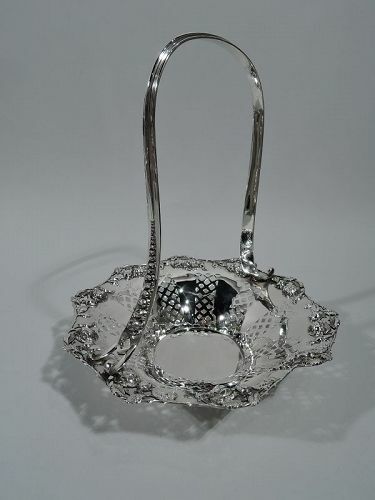 Pair of sterling silver baskets. 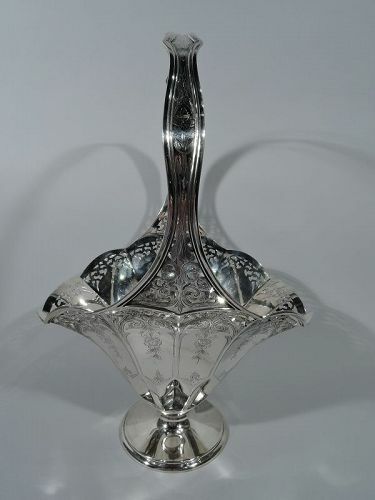 Made by Georg Jensen in Copenhagen. Each: Boat-form with c-scroll handle terminating in buds. Stamen support set in upturned petals mounted to round stepped foot. Visible hand hammering. Postwar hallmark includes pattern no. 235B. Very good condition. 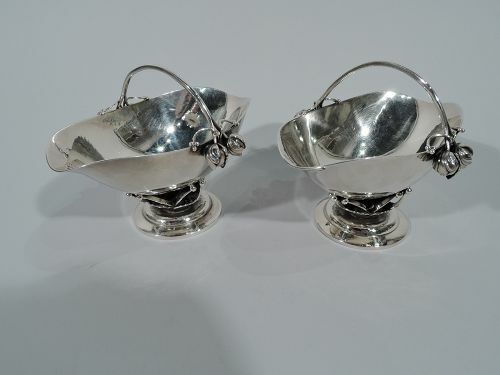 Pair of Edwardian sterling silver baskets. Made by Roger Williams (later part of Gorham) in Providence. Each: Solid quatrefoil well with tapering sides and wavy rim. 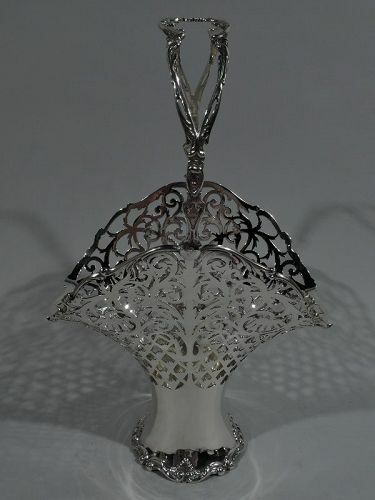 Sides have pierced quatrefoil pattern. Rim has applied scrolls and flowers. Hallmark includes no. 681X. Very good condition.